This All-In-One Ventilation System Offers An Energy Efficient, Aerodynamic Design With One-Step Installation For Exhausting Air From Buildings. Hood shutter includes removable cold weather, winterization slide seals that keep out the cold and protects motor and vent when not in use. 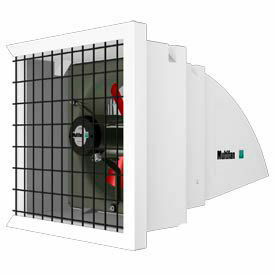 This ventilation system is great for warehouses, barns and even arenas! UV stabilized, rust resistant PVC shutters utilize nylon pivot points. Polypropylene blades are powered by an energy efficient wash down motor. 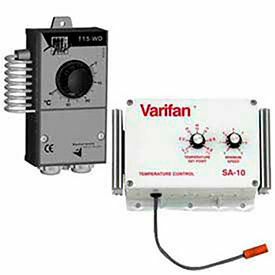 Motor is housed in die cast aluminum that offers automatic thermal protection and internal heat resistance up to 311°F; ambient temperature rating of 155°F. Aerodynamic polyethylene hood offers a unique design for precise air movement expulsion without external wind interference. Hood is corrosion resistant and UV stabilized. Fiberglass venturi resists traditional shrinkage while providing uniformity in wing tip clearance. Offers easy one-step installation using a flush mount with four lag bolts; can be mounted to wall, sidewall or framework. 1600 RPM. 3 Year Limited Warranty.